Will the Real Hero Please Stand Up: A Call For Men to be Men! < svg > Created with Sketch. Jet Lag. Silence and Waiting. I Want To Forget Today; But I Hope I Never Do! February 5, 2013 - 1 comment. Will the real hero please stand up? I have to be honest. I’ve been troubled over the past few weeks at all the attention that is being given to men who the media prop up as heroes. You know the types: Tiger Woods, Lance Armstrong among others. My son’s 7th birthday was yesterday and it saddens me that he won’t have any real heroes to look up to. It’s time for the honest and genuine men to step out of the shadows; it’s time for the real heroes to shine. It is time for us men to put down our iPhones and pick up our children. It’s time to show them they are more important than whatever is on our iPad. It is time to love and respect our partners. It is time to treat yourself with respect. It is time for men to be men. Real men know how to dream. Real men know how to lead; better yet real men know how to be led. Real men are not a fantasy. They live and work with us every day. This isn’t the call for perfect men. This isn’t a call for fake men. I can spot them a mile away. Fake men look and act like they have it all together. These men are fooling themselves. We’ve all been there and I’m here to tell them to stop. If you think you’re guilty of being fake or perfect: STOP! It’s simple. Be a hero to those around you. How you may ask? Be real. Be a man of character. Be a man of honesty. Be a man that thinks of others first. If men would just be themselves without the ego there would be no shortage of heroes for our kids to look up to. If men would be committed to their marriages, if men would be honest with themselves and those around them, if men would do what is right, we would never have to look for heroes again. In the coming days some of my heroes, men that I respect are going to come here and tell you who they see as heroes. They will tell you who they see as real men. Why? Because we all need to see what a real man looks like. We all need to be reminded that they are out there. They’re real men, real heroes who are living life around us, with us. I want to shine a light on the amazing men among us. 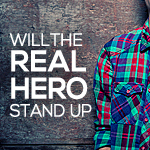 The ones who’ve heard in their own lives “Will the real hero please stand up?” and they answered. They live honorable lives. They live their dreams. They lead because they know they have too. “be a hero to those around you.” dude ~ you have no idea how close that hits home with me. i focus so much on being a hero to customers and clients – but it’s the ones who are really “around me” that i’m the least heroic with sometimes. wife, kids, family – and they need me to be a hero more than anyone else in the world does. thanks for the blog, man – glad i finally found it.